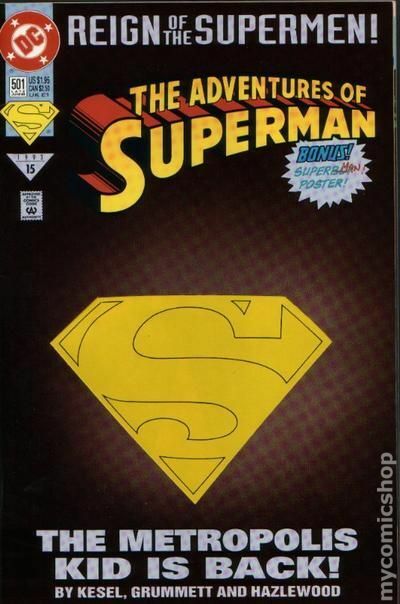 Die-cut cover. The Ogre and the Ape - Written by Doug Moench. Art by Kelley Jones and John Beatty. A major new villain is introduced in this extra-sized issue! A very powerful being is killing Gothamites. The only clue to the killer's identity is a graffito scrawled on the walls of the city's buildings. 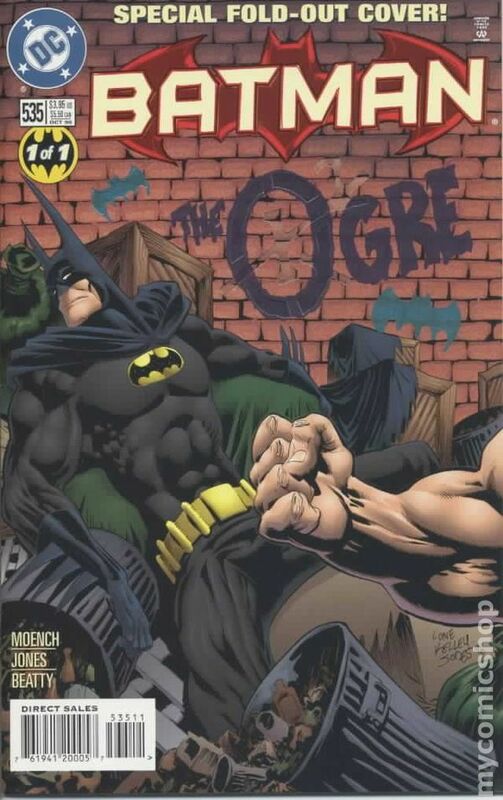 Batman must solve the puzzle before the body count rises, and face one of the strangest adversaries in his career -- The Ogre! 48 pages, full color. Cover price $3.95. 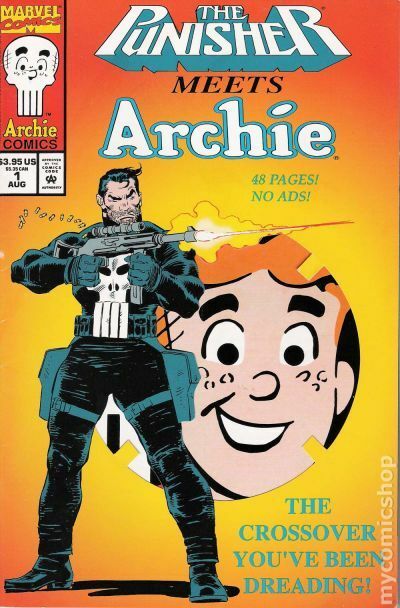 Cover art by John Romita Jr. Die-cut cover. 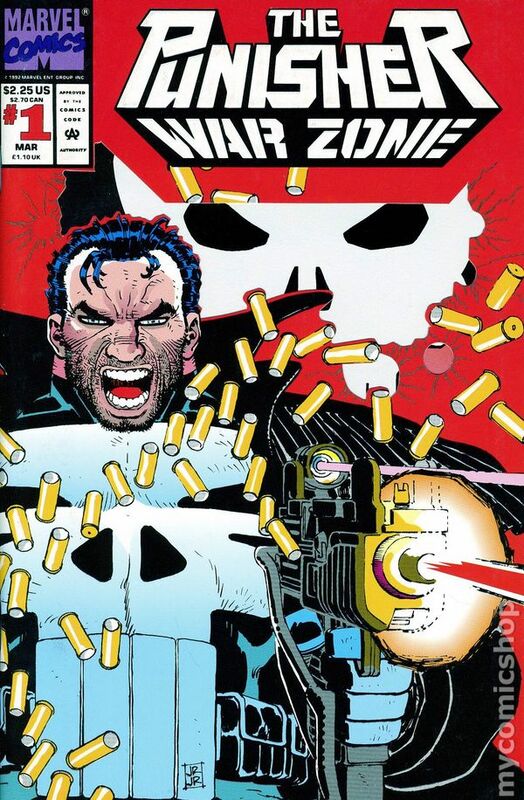 Only the Dead Know Brooklyn, script by Chuck Dixon, pencils by John Romita Jr., inks by Klaus Janson; Punisher follows Microchip, who's seeing a psychiatrist; Punisher goes undercover and is introduced to the Carbone family as Johnny Tower. 40 pgs. $2.25. Cover price $2.25. 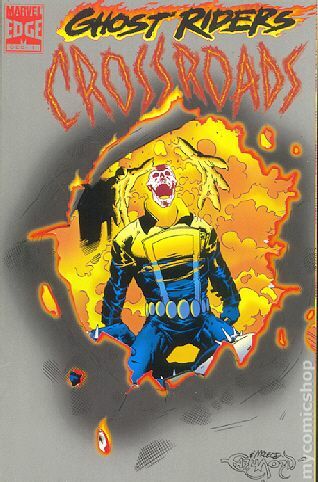 Die-Cut Cover - "Crossroads!" Written by Howard Mackie and Ivan Velez, Jr. Art by Cary Nord, Bob McLeod, and Al Milgrom. The sinister Blackheart kidnaps Danny Ketch and the villainous Scarecrow and draws them down into his abysmal realm. Then he re-bonds the demon Zarathos to the mortal Johnny Blaze with hopes of enslaving the Ghost Rider as his agent on Earthrealm. Meanwhile, Danny must somehow defeat the Scarecrow without the power of Ghost Rider or be forced to spend eternity in hell! 48 pages, FC. Cover price $3.95. 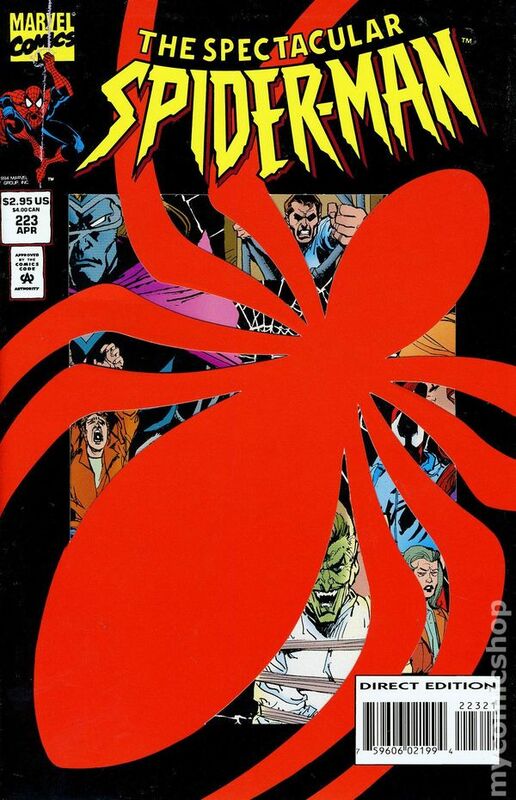 Die-cut cover. "Schemes & Dreams: for Future Screams." Aftershocks, Part 2 of 2. Script by Tom DeFalco. Art by Sal Buscema (breakdowns) and Bill Sienkiewicz (finishes). 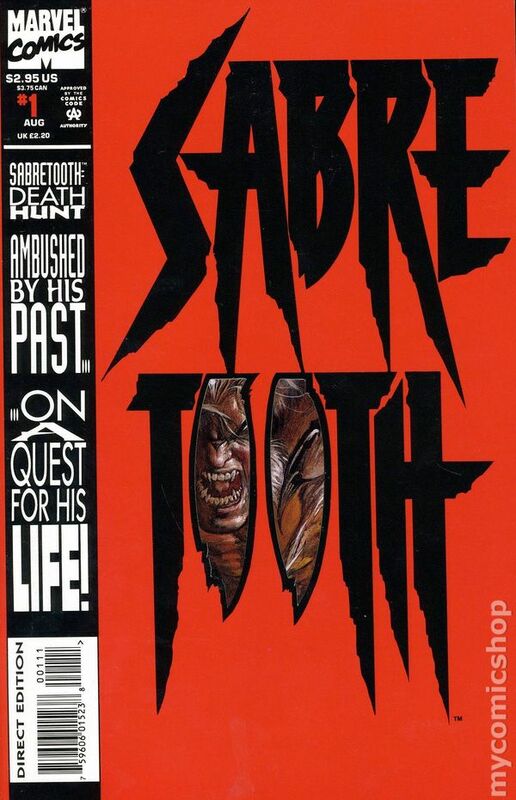 Cover by Sal Buscema and Bill Sienkiewicz. Story continues from Spider-Man 57. While Peter Parker remains behind bars on false murder charges, Mary Jane and Ben Reilly come to grips with their respective situations. MJ needs the Scarlet Spider for protection! And Ben needs a cause to give his clone-life meaning! It won't be long before their newfound partnership is tested! In the meantime inside Ravencroft Institute, the Jackal causes trouble for as many people as possible! And on the outside the mysterious third Peter Parker achieves self-awareness! Cameo appearances by Carnage, Shriek, John Jameson, Dr. Kafka, Joe Robertson, Kaine, and Scrier. Second story: "The Beginning." The Parker Legacy, Part 3 of 3. Script by J.M. DeMatteis. Pencils by John Romita Jr. Inks by Al Milgrom. Story continues from Spider-Man 57. In a story set five years ago, Spider-Man's clone makes a new beginning and takes a new name - Ben Reilly! First pin-up: Spider-Man vs. the Green Goblin. Art by Sal Buscema. Second pin-up: The Lizard and Morbius vs. Spider-Man. Art by Sal Buscema. Third pin-up: Spider-Man vs. Mysterio. Art by Pat Broderick. Fourth pin-up: Daredevil and Spider-Man. Art by Tom Grummett and Scott Hanna. 52 pages. Cover price 2.95. Cover price $2.95.